And so the second chapter in the London foursome’s ascent begins. 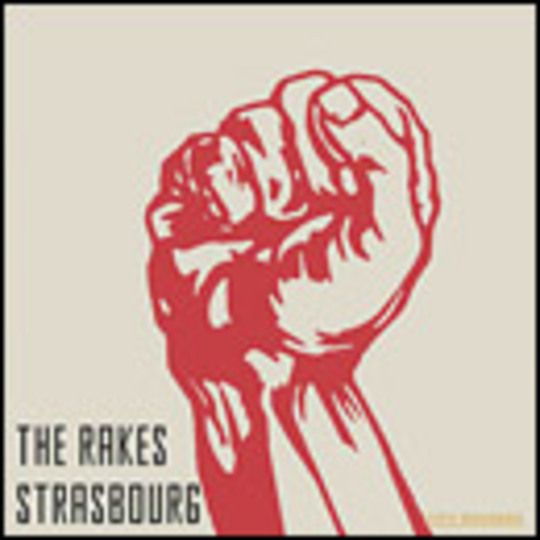 Following the endlessly quotable ‘22 Grand Job’, The Rakes' follow up takes us beyond the confines of numbing city grind and sends us careering into the icy trappings of 1980s Europe. Not the most obvious of lyrical moves you might say, but as this attacking militaristic stomp begins to roll, it’s obvious that yet again this band have produced an interesting and acutely clever song. Backed by the frustratingly feisty ‘Just Got Paid’, the band’s first proper release is excitingly defiant and craves to be played at a very loud volume - images of listeners bouncing off their bedroom walls shouting, “Just got paid / Can’t get laid!” are evoked at every twist and turn. Inevitable Strokes comparisons flutter away after 'Strasbourg' clatters through its exclaimed chorus, and unlike Casablanca’s idle drawl, Alan Donohue’s vocal delivery is exact, gritty and happily British. With producer Paul Epworth making sure the band’s live turmoil is captured with ruthless, tinny abandon, The Rakes re-affirm their place within the top echelon of new British guitar music.